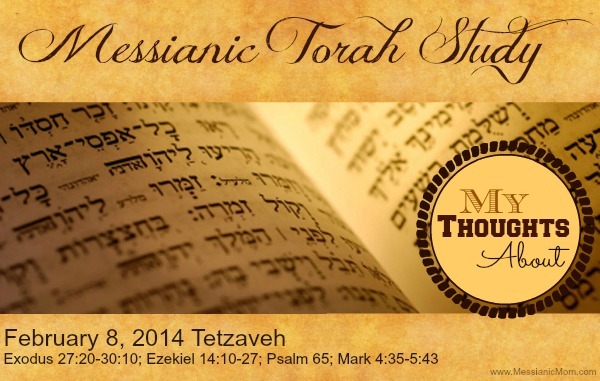 These are my thoughts on Torah Portion Tetzaveh, this Shabbat’s Torah portion. At the beginning of this portion, we are told the children of Israel are to provide pure olive oil for the Light in the Tent of Appointment. Don’t you just LOVE that language… Tent of Appointment. Doesn’t that give such a clear picture of what the purpose of the tent was? And light… notice the children of Israel played a critical role in the provision of Light… if they didn’t bring the olive oil, the lampstand had no light. Of course, if Abba wanted that light there, He would provide… but I think this is a great way to start the portion; we have a role in the walk of not only ourselves, but those around us. Notice the lampstand is only lit through the night and that the Priest is responsible for maintaining this light… so the Children of Israel have a role in the light as well as the Priests. We have an action item! And it is an everlasting law… however, since we don’t have a “Tent of Appointment”, this is one of the laws that cannot be fulfilled until we have a Temple. We now get to the Priestly Garments and their pattern. I love the details that are in this portion. Try to slow down and really study these words, each one is so rich in meaning and so much can easily be overlooked. For example, so many want to say that the Ruach (Holy Spirit) was not given in the “old testament”, but that is not what scripture says. Here in Exodus, we see another example of people filled with the Ruach…. The base which supports the people. In the Priestly garments’ description, we see that the 12 Tribes names are engraved on two onyx stones which are part of the shoulder pieces of the efod. Isn’t that amazing? The very definition of the word means base that supports and then we read in scripture that the names are on the shoulders of the Priestly garments. That is Hebrew for you. It usually focuses on the function and purpose, not the description like Greek. Take a Pencil, for instance.. In Greek thought, you might say it is yellow, long, has an eraser on one end, lead on the other, made of wood, etc. In Hebrew thought, you would say, it is a writing instrument. Function, purpose. We move onto the “breastpiece of judgment”. Here we see a list of stones that are used for each Tribe. I have not fully studied this section out, but I can guarantee you there is meaning in these stones associated with each Tribe! One thought that comes to mind though is that now we have the tribes on the Priest’s chest. First they were on the shoulder’s and now on his breastplate near his heart. Near and dear and supported by the Priests. That is how I see this description. Remember the priest went in to atone for their sins. Act as their mediator. We already have Moses as a model… he was always on his face praying for this people, protecting this people, interceding on their behalf. Exactly what the priest was to do. We have very, very, very precise pattern here. Do you think Abba is about happenstance or precision? Yeah… we have patterns to live by, like everything else in nature. There is so much more here than I have studied out… the pomegranates, the bells, the Urim and the Tummim.. what do they all mean? Don’t just rush past this section (or any section for that matter). Spend some time here really studying the Word! Did you notice in Chapter 29 it is Matza (unleavened) bread? Does that give you a clue as to the time of year? If you are familiar with the feasts, it should. What feast do you only have Matza? I love the description of the Turban. That is such a foreign thought and not many of the Cohen Gadol (High Priest) images I see have them in turbans. But, these were Middle Eastern men. So when we give up our westernized vision of Scripture, we realize, this is exactly fitting! When we striped all the “jewishness” out of scripture, we stole the meaning and richness of it! Exo 29:20 Then shalt thou kill the ram, and take of his blood, and put it upon the tip of the right ear of Aaron, and upon the tip of the right ear of his sons, and upon the thumb of their right hand, and upon the great toe of their right foot, and sprinkle the blood upon the altar round about. What is up with the ear, thumb and toe being slathered in blood? Well the ear represents hearing… Shema, Hear O Israel. (Hear and DO). The hand represents work. Our hands are to be doing His work and will. And toe represents walk / path. Walking Abba’s path. Remember Hebrew is about function and purpose not description! Makes so much sense, doesn’t it? I know! There is more to this portion, but I think I’ll close it here. I encourage you to really slow down and put some effort into studying the Word and learning what the intended meaning was (not our westernized version… but the Ancient Middle Eastern version that it was written in, by and for). In my humble opinion, the fact that the West assumes it is all about their understanding is another form of pride and arrogance. The entire Bible is about the Middle East, that is the location where everything takes place, to Hebrew people, that spoke a Middle Eastern language in ancient times with ancient customs and thoughts. Study it out… there is so much richness there! Abba will grant wisdom to those that seek it! He promised that! Until next time, Shabbat Shalom! And thank you for sharing your thoughts on this Torah Portion. The “Detail” in this portion is a bit overwhelming, until, (like you say), you “Slow Down”. This is not a portion that one can glean much by reading the entire thing, then “Meditating” on the big picture. This is more of a “Glean as you go along” portion. The “Big Picture” here is actually hundreds of tiny “Little Pictures” woven together, like one of those photo collages. Sure….. you can fly through the Grand Canyon at top speed in a fighter jet & still appreciate it’s size & grandeur. But you see a much different canyon if you take the “Rafting tour”. I would like to point out one small correction though. The menorah is to remain lit “Day & Night”, “Continually”. You may have been thrown off a little by the “from evening till morning” statement. But I believe this is referring to a 24 hour period, as in Genesis, “And there was evening & there was morning, the first day”. It states in Leviticus 24:2 that the menorah is to “Burn continually”. I’ve been told the the light of the menorah represents the presents of the HOLY Spirit. Makes the miracle celebrated at Hanukkah so much more intimate, don’t you think? When the menorah remained lit for 8 days on one days supply of oil. Just long enough for them to make the oil to keep the lamp lit. It says to me that the HOLY Spirit wanted to let them know He was “Present” because “HE” want to be with His people. That His “Presents” was “HIS” doing. Love hearing your thoughts sister. Hey Frank, I have to agree that is what we have been taught that the candles burned continually… but I do have some questions about this. Ironically, last year for Chanukkah, we made a Chanakkiah that was of olive oil with a wick. The verses 27:20-21 discusses trimming the wick. I don’t see how you manage a wick when the wick is burning. And we learned that last year from our own experience. Have you ever thought about that? They all can’t be burning all the time. As for the “continual” thought there is another example in this very Torah portion where continual just means it happens forever… twice a day actually, forever. See Verse 42 below. From verse 36-41 we see when they are to be offered. Exo 29:36 And thou shalt offer every day a bullock for a sin offering for atonement: and thou shalt cleanse the altar, when thou hast made an atonement for it, and thou shalt anoint it, to sanctify it. Exo 29:37 Seven days thou shalt make an atonement for the altar, and sanctify it; and it shall be an altar most holy: whatsoever toucheth the altar shall be holy. Exo 29:38 Now this is that which thou shalt offer upon the altar; two lambs of the first year day by day continually. Exo 29:40 And with the one lamb a tenth deal of flour mingled with the fourth part of an hin of beaten oil; and the fourth part of an hin of wine for a drink offering. Exo 29:41 And the other lamb thou shalt offer between the evenings, and shalt do thereto according to the meal offering of the morning, and according to the drink offering thereof, for a sweet savour, an offering made by fire unto Yahweh. Exo 29:42 This shall be a continual burnt offering throughout your generations at the door of the tabernacle of the congregation before Yahweh: where I will meet you, to speak there unto thee. I’m not trying to be argumentative… but I need to see it in scripture. Judaism and Christianity have both taught things that don’t line up with scripture and we have to test everything! Thank you so much for reading my post and commenting. I agree there is more studying that needs to be done… and I don’t claim to know it all. As a matter of fact, I’m sure I’ll never know it all and probably a good portion of what I do know is not exactly accurate 🙂 But, I will keep studying and learning and trying to understand scripture.